“Galveston”/Glen Campbell. With the Vietnam War at its height, a soldier cleans his gun and dreams of his girl at home. I heard it the other day, unexpectedly on shuffle, and I was reminded of how awesomely good it is, not just Campbell’s singing but the Wrecking Crew backing him up, including Hal Blaine on drums and Joe Osborn playing the iconic bass guitar. (Second thought: that’s Campbell on the low, twangy guitar, although Osborn is on the record too.) I remember hearing “Galveston” on Mother and Dad’s radio stations long before I had a station of my own, and it never fails to make me think of springtime on the farm. “Dizzy”/Tommy Roe and “Proud Mary”/Creedence Clearwater Revival. It’s widely known that CCR hit #2 on the Hot 100 five times without ever hitting #1. 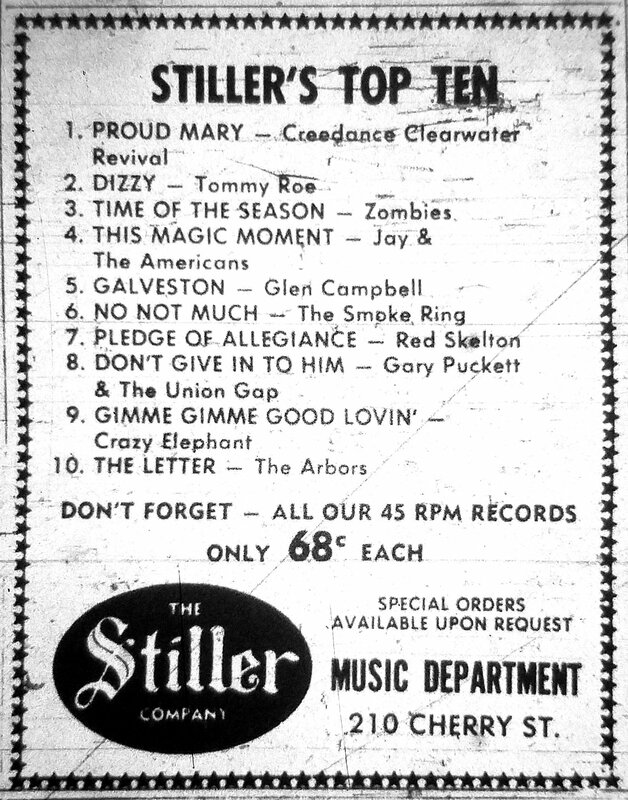 While history has given “Proud Mary” the last laugh, “Dizzy” was clearly the bigger hit back in the day, not just on the Hot 100 but in Green Bay, too, spending four weeks atop the Stiller chart before giving way to Creedence. “This Magic Moment”/Jay and the Americans. This version of the Drifters’ 1960 hit can’t decide whether it wants to recreate that old soul sound or update it for the bubblegum era, so it tries to have it both ways and accomplishes neither, although it did outdo the Drifters on the Hot 100. “No Not Much”/Smoke Ring. This is a cover of the Four Lads original by a group from Norfolk, Nebraska, and it did its biggest business on easy-listening radio. “No Not Much” went to #24 on Billboard‘s Easy Listening chart and #85 on the Hot 100. It hit the Top 20 at KHJ in Los Angeles, KOIL in Omaha, WRKO in Boston, and WHYN in Springfield, Massachusetts. “Pledge of Allegiance”/Red Skelton. I wrote about this record a few years ago: “On a January 1969 episode of his show, [Red] did a bit about the meaning of the Pledge of Allegiance, and expressed the fear that since the words ‘under God’ had been added, schools might consider it a prayer and ban it. At the height of the roiling 1960s, with the counterculture in full flower and the antiwar movement riding high, Skelton’s sentiments had broad appeal to Richard Nixon’s ‘silent majority. '” In addition to being sold in stores, “The Pledge of Allegiance” was also distributed by Burger King on a soundsheet. It made #44 on the Hot 100 and #25 on Easy Listening. “Baby Let’s Wait”/Royal Guardsmen. For most people, the career of the Royal Guardsmen begins and ends with three “Snoopy” records in 1967, but the group made the Hot 100 five other times, including the shimmering bubblegum of “Baby Let’s Wait” (released in 1966 before “Snoopy vs. the Red Baron” and reissued to become their last chart entry) at #35 and the trippy “Airplane Song” as #46. “Hot Smoke and Sassafras”/Bubble Puppy and “Tobacco Road”/Love Society. In the late 60s, the word “progressive” didn’t mean “obtuse, spacy lyrics and showy instrumental virtuosity.” It meant “heavy guitars, distorted riffs, and some organ mixed in now and then.” Both “Hot Smoke and Sassafras” and “Tobacco Road” would have been called “progressive” 50 years ago. The Bubble Puppy were discovered playing a hippie joint in Houston by a producer who promised them they’d be bigger than the Beatles. (Spoiler: nah.) The phrase “Hot Smoke and Sassafras” is supposedly an expression Granny used on an episode of The Beverly Hillbillies. Although the song never made it onto many oldies stations, it did go to #14 on the Hot 100 and was #1 in Miami, Fort Lauderdale, Denver, Toledo, and a handful of smaller markets. Love Society was from Plymouth, south of Green Bay and west of Sheboygan, and a predecessor of one of Wisconsin’s fondly remembered bands, Sunblind Lion. “Tobacco Road” is the John D. Loudermilk song that a lot of progressive groups covered. Love Society’s version didn’t make the Hot 100, and all but three of its listings at ARSA are from Wisconsin stations. Jeff’s weekly tweet of the Stiller Music chart is a vestige of his Packers Dynasty Twitter project, which followed the Green Bay Packers through their three consecutive championship seasons in 1965, 1966, and 1967, day by day. Thank you sir. The excellent Radio Rewinder Twitter feed recently tweeted, in pieces, a list of the Top 43 album cuts of all time, compiled in 1978 by Radio & Records, the now-defunct trade magazine. (Why 43? Just being quirky, as I recall.) As I was digging into my archives to find my copy of the list, I found another interesting one. In late 1979, R&R polled album-rock stations asking them to name their top tracks of the 1970s and created a Top-50 list out of it. In the archive where I found these lists, I found another list I made myself, sometime back in the early 80s, which is titled “Top Ten Artists From Both Lists Compiled by Me One Afternoon in May.” (Oh for chrissakes, Jim.) They’re as follows: Zeppelin, Springsteen, the Stones, Fleetwood Mac, the Doobie Brothers, the Who, Eric Clapton, the Beatles, Bob Seger, and Steely Dan. I noted that the Stones have twice as many songs as any other band on the lists, so why they weren’t #1, I don’t know, because I can’t recall the criteria I used. —“Born to Run” grew in stature as Bruce Springsteen did between 1977 and 1979, from #21 on the Top 43 list to #4 on the Top 50. So did “Hotel California,” going from #40 on the Top 43 to #8 on the Top 50, but it’s the only Eagles tune on either list. “More Than a Feeling” squeaked into the Top 43 at #42, but was #11 two years later. —“Miracles,” which ranks high on both lists, was considered a lot more “classic” at the end of the 70s than it would be today. Ditto “School,” “Year of the Cat,” “Stranglehold,” and possibly even “Roundabout.” I bet “Just the Way You Are” and “It’s Too Late” aren’t on many classic-rock stations today, either. —The inclusion of Aerosmith’s “Train Kept A-Rollin'” on the Top 43 list seems really weird now, especially at the expense of “Sweet Emotion” or “Dream On.” Also weird: the complete omission of Aerosmith from the Top 50. —Other omissions: no “Bohemian Rhapsody,” or anything else by Queen, on either list? No love for Led Zeppelin’s “Rock and Roll” or “Whole Lotta Love”? No Allman Brothers? One thing is for sure: the right crowd would party all night with either one of these lists, and in college, we did. I created a segued tape counting down one list or the other, and when we played it, over five hours pausing only for a single tape-flip, absolutely nobody went home until it was over, because the music kept getting better.